Riyadh, Jan. 22 (BNA): Minister of Foreign Affairs, Shaikh Khalid bin Ahmed bin Mohammed Al Khalifa, met today the Minister of State for Foreign Affairs, and Member of the Council of Ministers of the brotherly Kingdom of Saudi Arabia, Adel bin Ahmed Al-Jubeir. Riyadh, Jan. 22 (BNA): Minister of Foreign Affairs Shaikh Khalid bin Ahmed bin Mohammed Al Khalifa met today the Minister of State for Foreign Affairs, and Member of the Council of Ministers of the brotherly Kingdom of Saudi Arabia, Adel bin Ahmed Al-Jubeir. Shaikh Khalid affirmed that the brotherly relations between Bahrain and Saudi Arabia are of great interest and special priority for the two countries, making it a unique model of brotherly relations, based on solid foundations and continuous communication between both friendly countries and peoples, and are constantly witnessing significant progress and prosperity in all fields. He also pointed out that mutual visits and consonant coordination are an integral approach and a significant feature distinguishing the close relations between Bahrain and Saudi Arabia, thus reflecting their common and strong will to further pursue their relations, as well as their keenness to promote Arab interests and establish peace and security in the region. 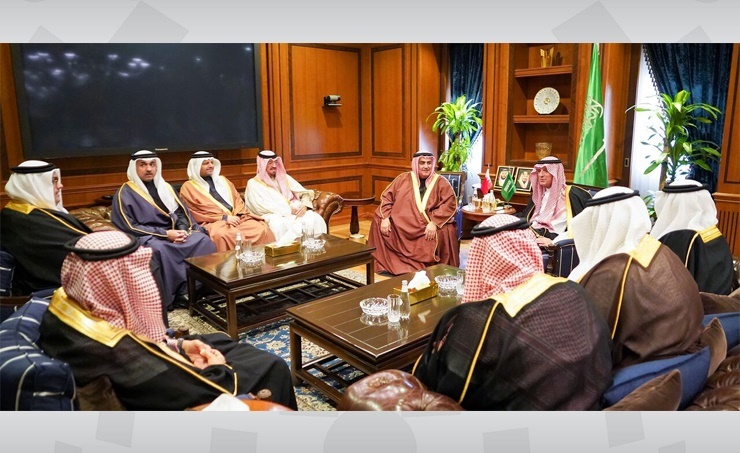 Al-Jubeir expressed his pride in meeting Shaikh Khalid and in the strong relations between Bahrain and Saudi Arabia. He also pointed out how their bilateral cooperation witnessed a great development at various levels, wishing Bahrain further progress and prosperity. Both sides exchanged views and consultations on the most important issues in the region, shedding light on the importance of supporting Arab issues and activating joint Arab action to preserve security and stability for the Arab countries and their peoples. The importance of confronting Iran's malign policies of hostile interference in the internal affairs of Arab states and its support for terrorism in the region was also stressed. On the Yemeni issue, both sides stressed the necessity to abide by what was agreed upon in the consultations of Sweden with a view to reaching a political solution between all the parties in the Republic of Yemen based on the GCC Initiative and its Implementation Mechanism and the outcomes of the National Dialogue and the relevant Security Council resolutions, resolution 2216 of 2015 in particular. On the Qatari crisis, the importance of Qatar's commitment to the Riyadh agreement, its executive mechanism, the Riyadh Supplementary Agreement and the demands made by the four countries to end the crisis with Qatar were stressed. Joint coordination and exchange of views on upcoming regional and international meetings have also been discussed. Shaikh Khalid toured the premises of the Saudi Ministry of Foreign Affairs, visited its Communication and Media Centre and signed their register of senior visitors. Al-Jubeir was at the forefront of those who welcomed Shaikh Khalid upon his arrival in Riyadh..